Just a few days ago, I wrote about how my search to connect my grandmother’s friends, rumored to be relatives, led me in a different direction. It helped me discover previously unknown-to-me cousins. This was a result of two-pronged research. I was researching my grandmother’s friend’s family to try to find a connection while also looking at my known relatives, immigrants from Lithuania, to see if there was a path I hadn’t traveled. While I was researching the friend’s family, I took note of the home addresses I found in the Brooklyn city directories on Ancestry.com. I periodically look through the hard copy records I’ve ordered received from various record keeping agencies, like the New York City Department of Records and the National Archives. In looking at my great grandmother’s naturalization documents, I noticed the address listed for one of the witnesses matched the address I had found just a few days earlier. The naturalization was witnessed in 1938, so I decided to try the 1940 U.S. Federal Census to see if more family information would lead me to some new clues. Visiting the Steve Morse website, I used the Enumeration District finder for the 1940 Census to pull up the images from Ancestry.com’s database. About three quarters of the way through the images, I found the address of my grandmother’s friend, and living there was the witness, Jennie Cohen. If the name weren’t so common, I could have just searched the index, but with several hundred Jennie Cohens in Brooklyn in 1940, that tactic wouldn’t have helped me reach the result nearly as quickly as browsing through the images in search of the address. Tracing this family back from 1940 through Federal and New York State Censuses, I saw the Cohens lived with or near the Ratzkens from about the time Sheina arrived in the United States. I mused the other day whether the Jenny Libynsky living with Frank Ratzken as a boarder in 1910 would be Sheina Mikhlia Lipianski, and I am now all but certain that this is the case. Sheina, or Jenny, married Israel Cohen in 1915, and I’ve already ordered the marriage certificate from the New York Department of Records for more confirmation. Their daughter, Bernice, is my grandmother’s friend we have suspected to be a relative. My great grandmother’s naturalization documentation made sense: her two witnesses were her husband and her sister. This is a good reminder that all the details on records are important, even witnesses and their addresses. There’s no question that had I started researching my family history earlier, I would have had a much easier time reaching conclusions. My paternal grandmother passed away in 2009, and I wasn’t particularly good at staying in touch with relatives separated by distance. Had I been, I might have also been inspired to learn more about the family while those who were the most knowledgeable were still able to share their stories. I’m hearing now that two of my grandmother’s closest friends might have been her cousins. To research this, I looked through census and immigration records to verify a connection within the last few generations. I didn’t get very far, and I haven’t found any clues that would help me. When I got stuck, I decided to take another look at my confirmed family tree and try to work outwards, towards these two potential cousins, starting from where I would expect them to be in the tree if they were in fact cousins. This led me to examine the immigration records for the Lepianski family again. My grandmother’s mother was known in the United States as Anna Lapinsky (married name Kerstman) but she spelled her name Chiene Lipansky when she traveled from Lithuania. 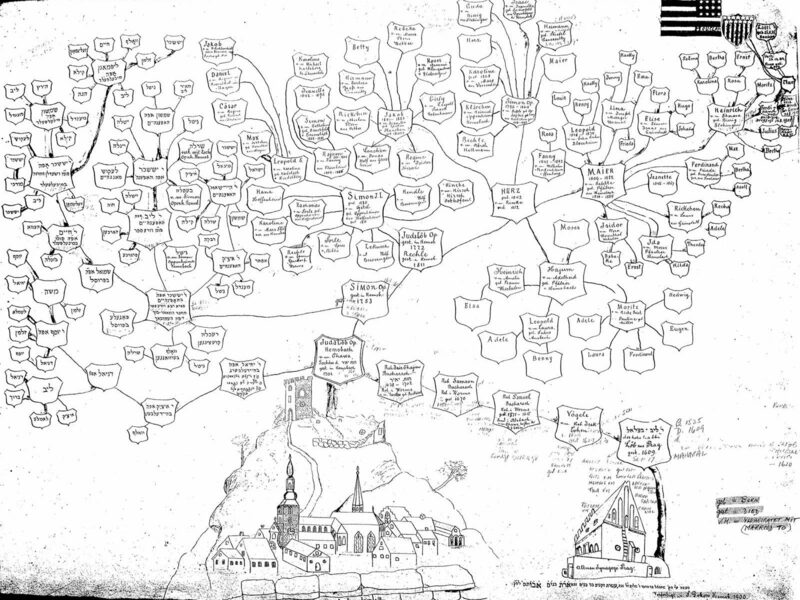 Indexes to Lithuanian records are readily available online thanks to JewishGen, and this allowed me to explore this branch of my tree deeper in history than any with other ancestor. 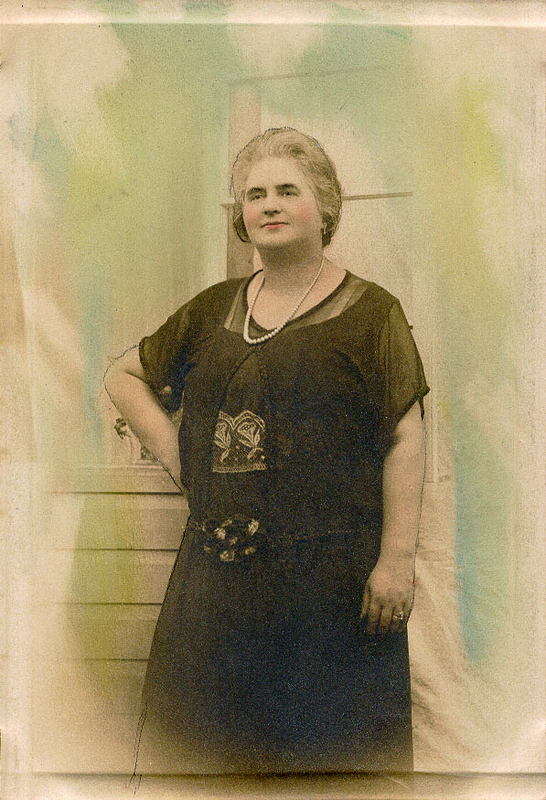 Lithuanian records transliterate her name as Khiena Liba Lepianski (or Lepiansky), and provided links to her brothers, sisters, parents, grandparents, cousins, aunts, and uncles, for several generations. 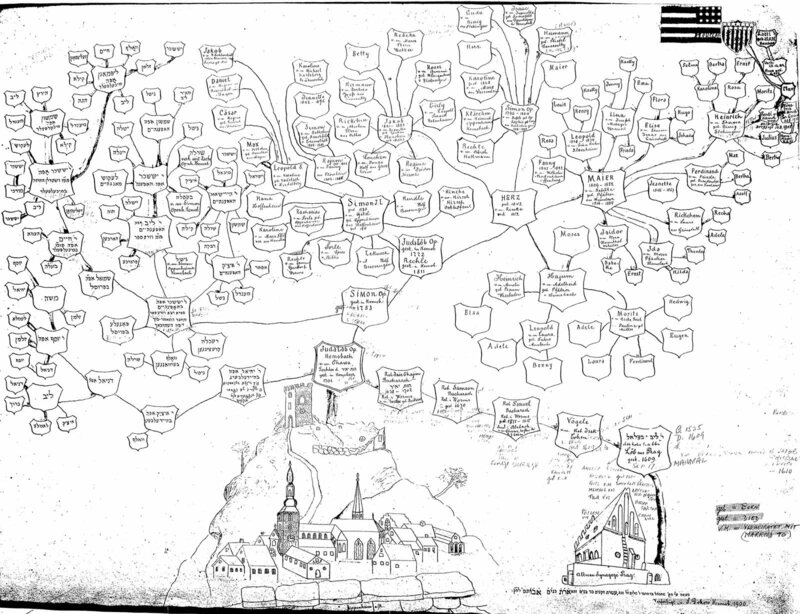 The records aren’t as easy to navigate as those on Ancestry.com, but they are surprisingly complete. 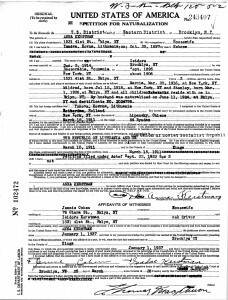 Before reviewing the Lithuanian records, I was aware that Anna’s mother, Ruth, my second great grandmother, was living with the family here in the United States by the time she was older. The Lithuanian records helped me realize that she would have traveled to the United States using the name Rochel Lepianski, and that led me to even more information about her other daughters — Anna’s sisters — who also came to the United States. At the time I was researching this branch, months ago, my discoveries ended here. I didn’t find anything about more Lepianskis living in the United States. Last night, however, I discovered what I missed. In the ship manifest for Rochel’s arrival in the United States, she mentions her contact in the United States her son. I did some preliminary research on this individual months ago and nothing turned up, but with fresh eyes, the handwriting became clearer. 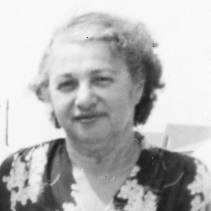 She and her daughter, Kreina, came to the United States to stay with her son (in law), Frank Ratzken (spelled incorrectly on the manifest as Ratzkin). I was able to track Frank to Paterson, New Jersey, where he and his family were in the business of silk. His wife was Minnie. 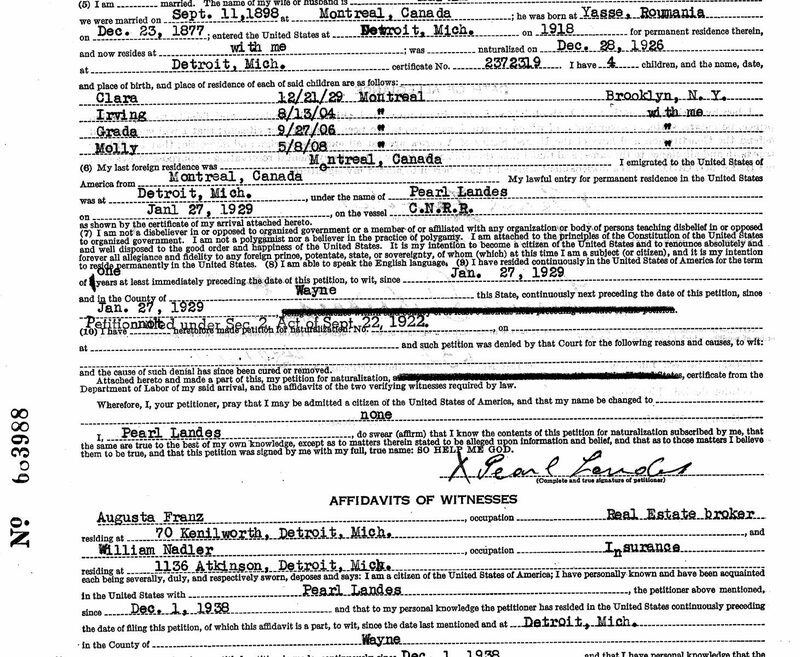 A little more research in Frank’s own naturalization papers confirmed his marriage into the Lepianski family. His papers pointed out that his wife, Minnie, was born in Jonava, Lithuania (Yanowa, Poland at the time). That led me to Minnie’s naturalization information, which provided the name under which she immigrated to the United States: Minnie Lopinksy. Her birth date coincides with the birth date for Khiene’s sister Mina Lepianski, and I’m confident enough that the two records are identifying the same person. In case there was still any doubt about the family connection, one of the witnesses to Minnie’s Declaration of Intention was Isadore Kerstman, Minnie’s brother-in-law. By 1930, the Ratzken family, including the children of Mina Lepianksi, was living just a few houses down the street from my maternal grandfather’s house. Although I haven’t yet found a connection to my grandmother’s two friends and possible cousins, a few hours of research have helped me identify blood relatives in the United States, and has given me a better picture of how the Lepianki family gradually came to the United States. What happened to Kreina Lepianski after she came to the United States with her mother Rochel? In 1910, Frank Ratzken’s home includes a boarder, Jennie Libynsky. Could this be Mina’s and Khiena Liba’s sister Sheina Mikhlia Lepianski? Different census recount different marriage dates for Frank and Minnie (Mina), and stevemorse.org is silent on the issue of marriage. Once you start looking into your family history, there’s no way to avoid sad stories. My paternal grandmother’s family are the Kerstmans. 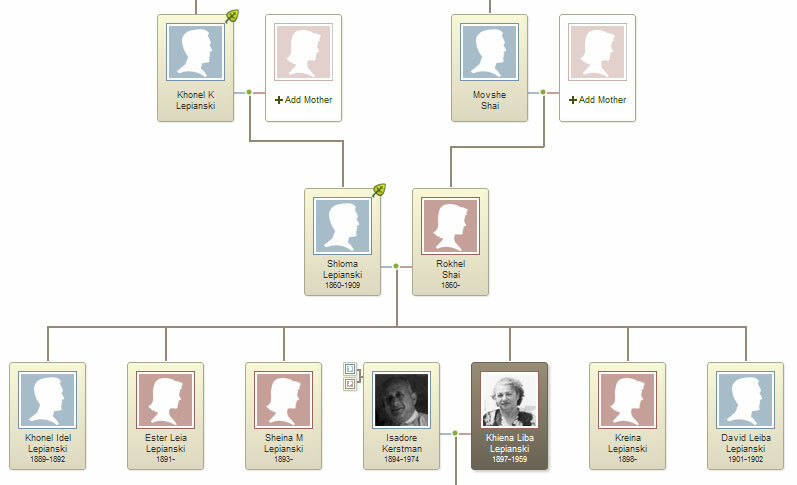 My great grandparents were Isadore Kerstman and Anna (Khiena Liba) Lepiansky. Izzy and Anna were both immigrants, from Russia and Lithuania respectively. They met in New York, and were married in December 1914. Three and a half months later, Anna had her first child, Sophie. No one in my family has told me about this first child. I was unaware of her birth until I started searching birth, marriage, and death records online for the name Kerstman. Kerstman is not a common surname. It’s a word for Santa Claus in Dutch, but that’s most likely not the source of the name in my family. Most likely, Kerstman in my family was a misspelling of Kurzman or Kurtzman — a common name meaning “short person” in Yiddish and German. Izzy’s surname was consistently spelled Kerstman by the time he was in the United States. 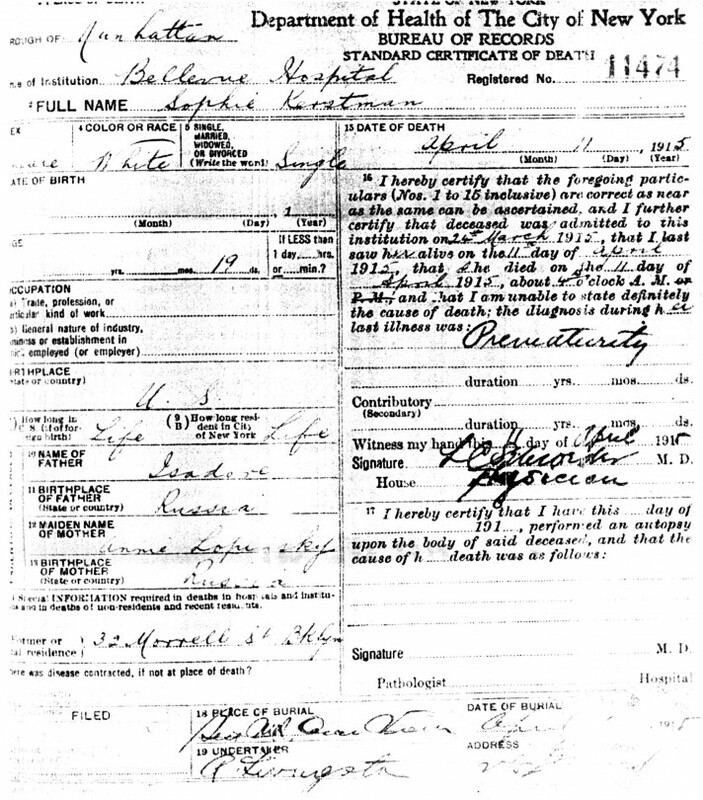 The search led me to burial records for a Sophie Kerstman, aged 19 days. The lack of other Kerstmans in New York at the time suggested that Sophie was a previously unknown child of Isadore and Anna. The timing was right, reinforcing the possibility of a match. 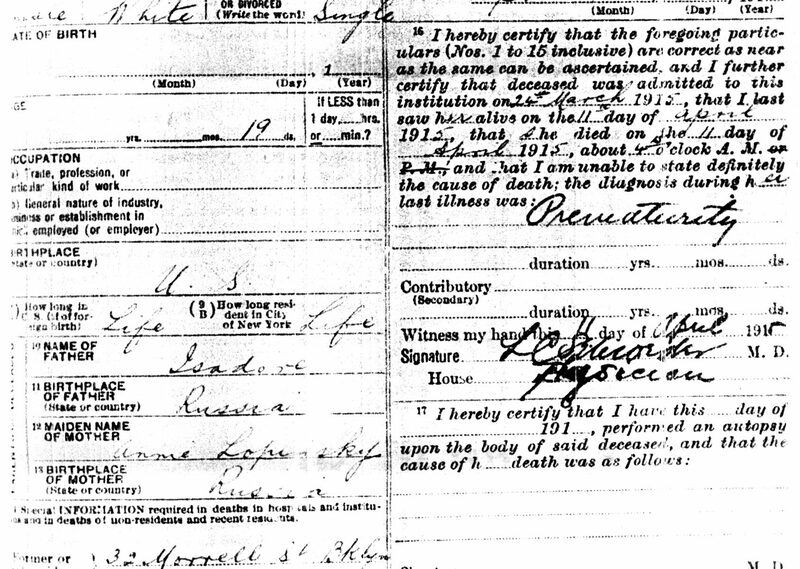 I ordered the death certificate from the New York City Department of Records to see if I could find additional clues. The death certificate confirmed my suspicions. Sophie Kerstman was the daughter of Isadore Kerstman and Anna Lopinsky, living at the same address I’ve already discovered for this family. Sophie was 19 days old when she died on 11 April 1915, and the cause of the death is listed as prematurity. The natural inclination is to consider that medical advances, nearly one hundred years following Sophie’s birth, could probably have allowed Sophie to survive had she been born today. They probably appreciated the community’s ability to take care of its members. As I wrote above, none of my relatives have mentioned Sophie Kerstman to me. Perhaps it was a sad story that the family did not like talking about. Perhaps my grandmother and her brother and sister did not even know about Sophie. I wrote last week about receiving Anna Lipanski Kerstman’s naturalization documents, which provided new clues to follow. One of these is the name she with which she was listed when she immigrated to the United States from Jonava, Lithuania in 1911: Chiene Lipansky. Chiene is a Hebrew name that is often Americanized as Hannah or Anna, so there’s no surprise with this information. There’s also no surprise with the idea that the last name could be spelled many different ways, from Lapinksy, to Lipansky, to Lipiansky, to Lepianski. It is this last spelling, in combination with her birth location of Jonava, that has opened new doors in research. Thanks to the LitvakSIG and their partnership with JewishGen, many Lithuania vital records — birth, death, marriage, and some census-like lists — are available online. A “SIG” is a special interest group. Groups like these generally began as email lists (or “listserves”) that allowed people with similar interests to discuss. Like many special interests groups focused on geographical family history, the groups have worked together to digitize and index records which previously were only available by visiting towns in Eastern Europe (or by paying someone overseas to do your research — sometimes a risky proposition). With these records searchable online, I found Chiene (or Khiena Liba) Lepianski (or Lepiansky, or Lepianskij, etc.) in Lithuania. Mere days after ordering a copy of naturalization papers for Anna Lipansky Kerstman from the National Archives, I received Anna’s documentation in the mail. The delivery was in a flat, letter-sized envelope, a feature I appreciated over the thrice-folded records received from New York City, creased to fit in a number 10 envelope. Not only was I impressed with the form, but I appreciated the content as well. 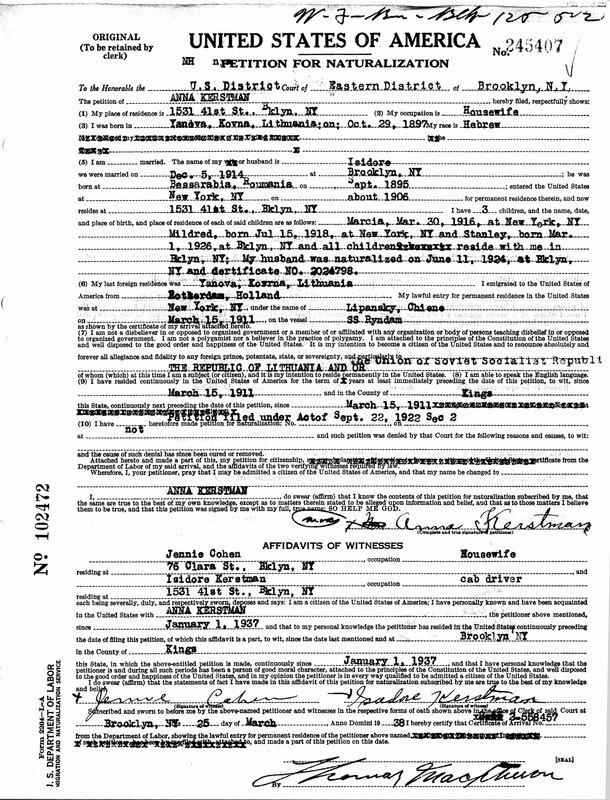 The documentation affirmed the date of naturalization for both Anna and as her husband, Isidore (Isadore) Kerstman. I’ve been recording Anna’s maiden name as Lapinksy or Lupinsky so far, but the naturalization and immigration documents include her last name as “Lipansky.” Anna’s marriage certificate, which I should be receiving soon, has an index wherein the last name is spelled “Lipiansky.” English spelling was not as important a century ago as it is today, and slight variations depended on whoever happened to be the scribe.